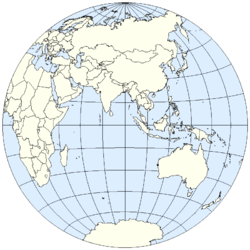 The Eastern Hemisphere is a geographical term for the half of Earth which is east of the prime meridian (which crosses Greenwich, London, UK) and west of the antimeridian (which crosses the Pacific Ocean and relatively little land from pole to pole). It is also used to refer to Afro-Eurasia ( Africa and Eurasia) and Australia, in contrast with the Western Hemisphere, which includes mainly North and South America. The Eastern Hemisphere may also be called the "Oriental Hemisphere". In addition, it may be used in a cultural or geopolitical sense as a synonym for the " Old World". Consequently, the meridians of 20°W and the diametrically opposed 160°E are often used outside of matters of physics and navigation,   which includes all of the European and African mainlands, but also includes a small portion of northeast Greenland (typically reckoned as part of North America) and excludes more of eastern Russia and Oceania (e.g., New Zealand). Prior to the global adoption of standard time, numerous prime meridians were decreed by various countries where time was defined by local noon (thereby, local meridian). ^ Olson, Judy M. " Projecting the hemisphere Archived 2007-08-14 at the Wayback Machine", ch. 4 from Matching the map projection to the need Archived 2007-08-18 at the Wayback Machine; Robinson, Arthur H. & Snyder, John P., eds. 1997. Bethesda, MD: Cartography and Geographic Information Society, American Congress on Surveying and Mapping.